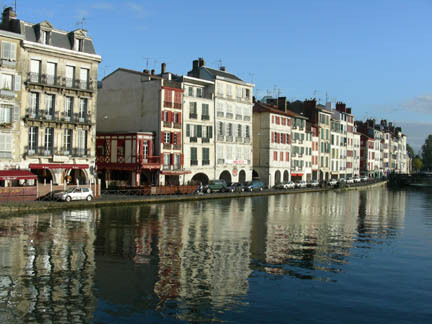 We limped into Bayonne. We had been having battery problems for 2 days, since Burgos, Spain. And the switch that controls whether we can use the reverse gear or not was acting up. At times it prevented us from starting the bike because it thought it was in reverse. We lost all battery power in Bayonne. I contacted the Honda shop (3C Motos - Roues Libres) and they arranged for a man to pick up the bike and bring it to them. They decided it was the alternator and I ordered a replacement one. With the weekend and shipping time we were there 5 days. It gave us lots of time to see the town. We moved into an old hotel in the old town. It was not only cheaper, it took only a 1/2 km. walk and one bus to get to the shop, as opposed to a 1 km. walk and two buses. Our hotel was in an old building like these but had a view of the old fort, not the river. 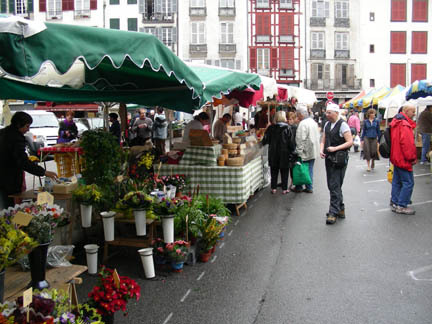 On the first day we toured the Saturday market and walked around the old town. We toured old narrow, cobblestone streets and peeked into small shops. We had some of the world's best hamburgers at a tiny shop (about 8' by 20') with a counter and two stools. It was called Worldburger and each burger had a world city name. They were delicious! 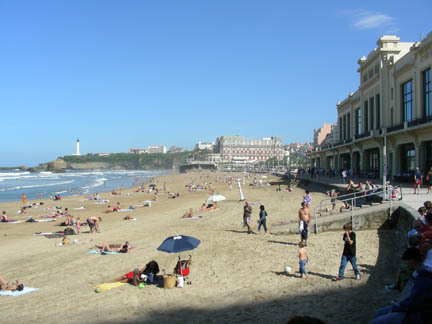 On Sunday we took the bus to Biarritz (a very expensive and exclusive town) and walked along the beach. It was a very "French" beach. Intermot started on Wednesday and the new alternator came in that afternoon. The shop worked hard and got the bike fixed that afternoon before quitting time. They installed the new alternator and we jury-rigged a patch for the reverse switch. The next morning we left for Intermot. It is a two day trip. And here's the proof that's it's a French Beach! These two ladies are just left of the blue umbrella in the picture above.